Living Thailand Eco Samui is the half day tour operates every Monday, Wednesday and Friday. The trip start picking you up from the hotel and take you to see the monkey at work, collecting the coconuts. Then go to Baan Chang camp to do elephant trekking about 30 minutes. Following by seeing the show of Thai Cooking at the elephant camp. Later take you to see Namuang Waterfall Number 2, a little trekking in natural walk way and you can swim too. After swimming, you can have lunch at the local restaurant nearby the waterfall. Next going to see the local factory of Samui OTOP (One Tambol One Product) and you can buy souvenirs of handicrafts that made by coconut wood. Then visit the mummified monk at Kunaram Temple and transfer you back to the hotel. Living Thailand Eco Samui program may change the order of the places that explained above, up to the high time. Please click at Book Now Button below to book and choose the payment method in the form. Or send inquiry form below. See the monkey at work, collecting the coconuts. Go to Baan Chang camp to do elephant trekking about 30 minutes. 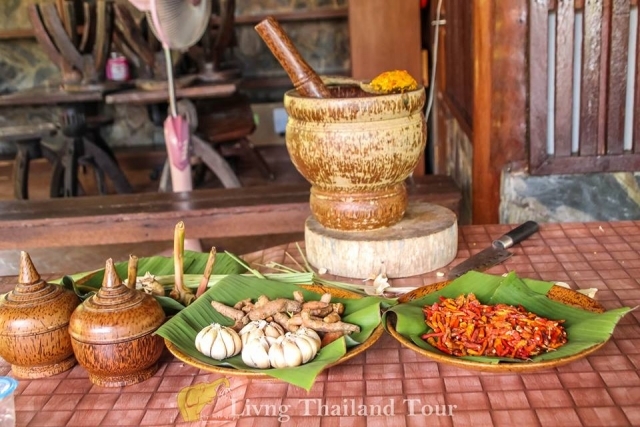 See the show of Thai Cooking at the elephant camp. See Namuang Waterfall Number 2, a little trekking in natural walk way and you can swim too. Have lunch at the local restaurant nearby the waterfall. see the local factory of Samui OTOP (One Tambol One Product) and you can buy souvenirs of handicrafts that made by coconut wood. And transfer you back to the hotel. You will come back to te hotel about 13:30 - 14:00 Hrs. Any comfortable dress. For the temple visiting, wear T-Shirts cover your shoulders. You can wear the shorts about knees length is o.k.